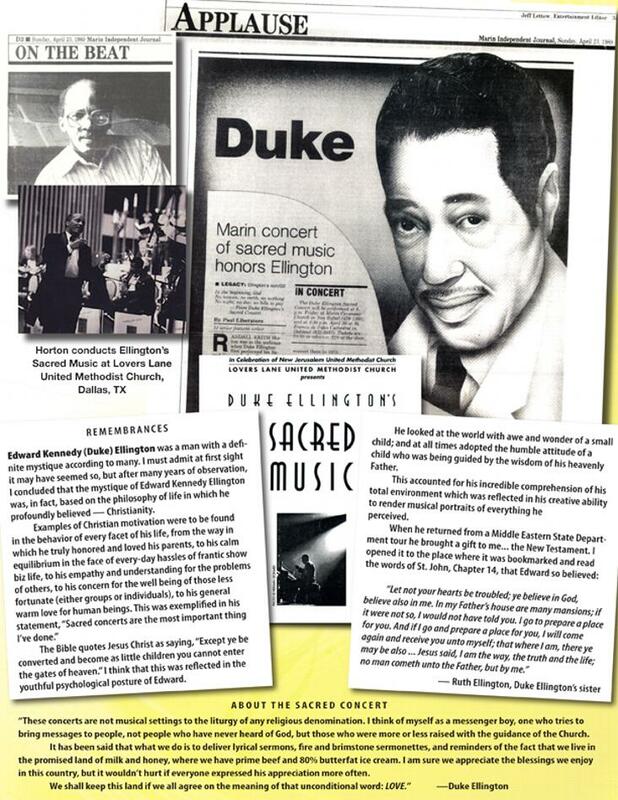 Through more than two decades of sharing faith, discussing the spirituality instilled by their mother, and agreeing about the importance of God's ministry in Duke's life throughout his music career, Ruth Ellington consistently helped Randall to understand the blessing entrusted to him from her brother. Those who knew her well knew of her deep personal religious faith. Randall's long tenure in church music ministry, a direct outgrowth of the calling that also led to his having been chosen by Mr. Ellington, helped to continually strengthen his near-family relationship to Ruth. It is from her ministry to him that Randall presents this music. 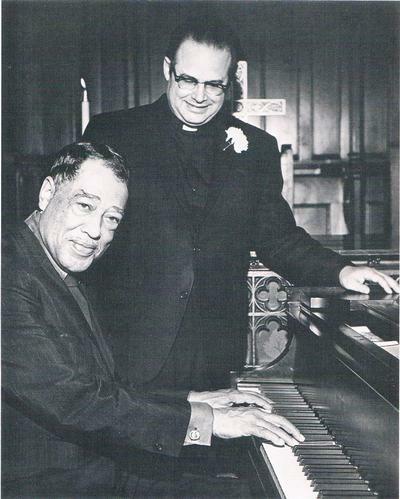 Above: Duke, with Pastor John Gensel, a long time friend of the Ellington family, "Pastor to the Jazz Community", and Director of Jazz Ministry, St. Peter's Lutheran Church, NYC. Pastor Gensel personally encouraged and guided Randall in the early years of his entry into his life as an Ellingtonian. 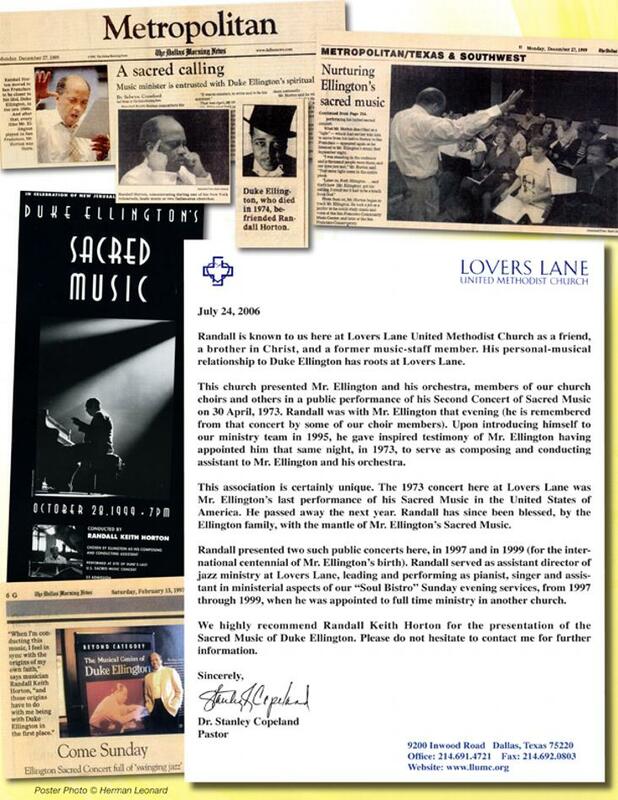 Below: Marin County, CA, news article; program from a Sacred Concert performance at Lovers Lane United Methodist Church, Dallas; Ruth's Remembrance of her brother's spiritual life and beliefs. This is the Church where Duke performed his last Sacred Concert in the United States of America. It was at that concert (30 April 1973) that he gave Randall his job description as a new member of his "team" (his orchestra). Copyright (c) Randall Keith Horton. All Rights Reserved.